Another six sites (89 ha) added to project area! 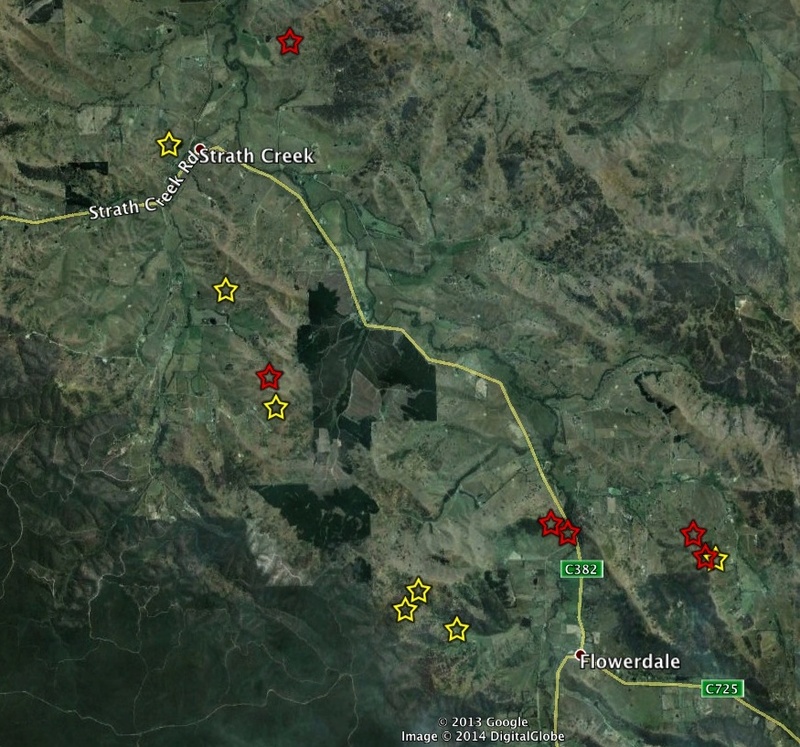 New project sites (red stars) and existing sites (yellow stars). At its last meeting (24.1.14), the Steering Committee approved expanding the project to include an additional six sites, totaling 89 ha! This increases the total area being rehabilitated for biodiversity conservation from 140 ha to 229 ha! The extensive use of corporate volunteers; this has injected in the order of $15,000 of volunteer labour into the project to date (with more to come). The involvement of project partners, like 15 Trees, that have donated thousands of seedlings to the project. The re-use of thousands of tree guards and stakes, saving the project many thousands of dollars. The willingness of landholders to set aside substantial areas of steep hill-country for native vegetation rehabilitation, protection and establishment – far greater than the area initially envisaged. The considerable capacity the Strath Creek Landcare Group and Upper Goulburn Landcare Network have developed in recent years in delivering complex, landscape-scale biodiversity projects.